Want A New Wardrobe For You AND A Friend For $25!?? Have you ever wanted to know what it feels like to be in someone else's shoes? Well, thanks to the Clothing Exchange which organises clothing, shoes and accessories swaps across Melbourne, Sydney, and Hobart, you can experience being in someone else's pre-loved shoes for yourself! The initiative was founded by Dr. Kate Luckins in Melbourne, Australia in 2004. Kate is passionate about sustainability, a topic also close to my heart. So, eager to learn more about how the Clothing Exchange started I asked her a few questions. NF: How did the Clothing Exchange first start? KL: While I was doing my Masters of Fashion at RMIT I was looking for a way to reconcile my love of fashion and my ecological conscience. As an avid op-shopper, I realised reusing clothes was the only way. I researched fashion waste and realised it was alarmingly high $1.5 billion is spent on clothes we don’t wear each year. So, I designed a swap service, tested it and when it was successful, we kept going and upscaling. NF: How long after doing this did you see that this could be a viable business model? KL: When I won an RMIT seeds grant and got mentoring in social entrepreneurship. We are a for purpose business so any events that raise funds are reinvested in developing further. But the council events, corporate events and swap tours we did for a PR company are the more viable “business” avenues but the regular monthly swaps we host for our swapping community are lovely and where we began. We are motivated by having a positive environmental and social impact rather than being driven by the bottom line like most businesses. NF: How did the partnership with Melbourne Fashion Week help with getting your message about sustainability to consumers? KL: It was great for raising our profile in 2006 and we collaborated for a decade. It was good to align sustainability with fashion for us and the festival. Popular media played a bigger role over the years with us being featured on radio, tv and even the Financial Review. NF: Since then how has the Clothing Exchange grown? KL: We continue to adapt our service offering. From standard swaps to launches, PR events, corporate and council outreach programs, a national tour of 5 events and also testing an online swap model. NF: What are your favourite swap success stories? KL: I like the small stories where people delight in finding a vintage frock, or a girl moved to tears when she found a designer dress she’d coveted but not been able to afford. The funny stories where someone took a tutu or a hand painted poodle tee are good value too. The biggest success is that our model has been adopted by many and we have put swapping on the map and amplified interest in swapping over shopping. We are especially proud of our own charity fund raiser swaps and also that the model has been used to raise funds for Oxfam, and clothes donations from us also made their way to Red Cross, Fitted for Work and Save the Children. NF: Where there any swap fails or laughable moments? KL: Fairy floss machines and clothes swapping don’t mix. NF: What are your future goals and plans for the Clothing Exchange? KL: To increase the reach and impact we are having so that everyone can swap instead of shop. To collaborate with and support like-minded people in the field of sustainable fashion. To educate consumers about the need to consider the impact of what they buy. So, how you may ask, does this work? I spoke to Stacey Kirkby who first started as a volunteer and now runs the Melbourne division of the Clothing Exchange. These clothing swaps operate on a no currency system. Swappers bring in 5 quality items. They must be clean, with no holes and in a good wearable condition, think of the type of quality you would proudly want to give to your friend. In exchange for these garments, you will receive 1 button token per garment. These tokens can then be redeemed on any clothing, accessory or footwear item your heart may desire at the swap event. Stacey loves the “impact they are making and [how these swaps] are slowing down fast fashion”. As do I! This alternative way of shopping has certainly peaked my interest so, I decided to try it first-hand. I was lucky enough to attend my first ever clothing swap with the Clothing Exchange back in November last year. This is how it went down…. The Melbourne Clothing Exchange team, November 2017, Moonee Ponds. I arrived with a dear friend of mine, who I may add, was the one who had been raving on about how good these swaps were in the first place! 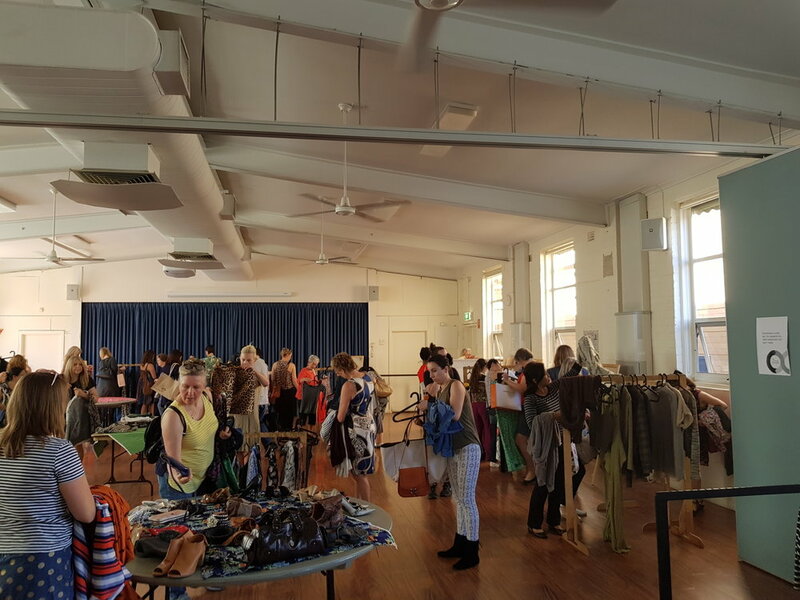 We got to the community hall in Moonee Ponds early, where the swap was taking place. A huge line was already forming at the entrance, snaking down the steps and onto the road. I could sense the anticipation in the air as the swappers eagerly waited for the doors to open. At 10 am on the dot, the doors flung open wide with a whoosh. Like a gaggle of geese, everyone flocked inside and patiently waited for the formalities to take place. During the proceedings, you could see the eyes of swappers scanning the racks of pre-loved clothing treasures. Mentally planning which pieces, they wanted to collect. Then as if a racing gun had fired to signal the end of the formalities, swoosh, swappers were off and almost racing across the floor to capture the prized item they spied across the room. But to be perfectly honest, I was no different. I spotted in the very far right-hand corner of the hall, the cutest pastel blue and white striped shirt dress. I made it my mission to obtain that piece first! Making a beeline towards it, I picked it up and checked to see if it was my size and to my delight, it actually was! I continued my hunt until my arms were full and the 5 tokens were utilised. I have to say that I got such a rush of excitement from finding these new pieces that will now take pride of place in my wardrobe. It felt so good knowing that I didn't spend a single cent and that I had enriched the lives of others with my once cherished clothing pieces. This swap showed me that one man’s trash truly can be another man’s treasure! Also, from an environmental perspective, these clothing swaps just make sense. According to textilebeat.com.au “Aussies send 85% of [their] textiles to landfill”. It's such a waste of our precious resources and not to mention damaging to our environment. I would strongly encourage you all to experience and attend one of these swap events… in fact, the Clothing Exchange has one on this weekend and are offering 2 tickets for the price of one! The Clothing Exchange swap is on this Sunday the 29th of April as part of Fashion Revolution at The Space in Prahran. It's a fun day out with your girlfriends minus the guilt of spending your hard-earned paycheck! Plus, our planet will thank you for it! So, give your wardrobe an overhaul, and check out Clothing Exchange for more details!